I CUT MY TEETH ON COMMUNITY JOURNALISM and this week’s story in Wall Street Journal is proof that even in the midst of a huge metropolis, you can still find a little village. 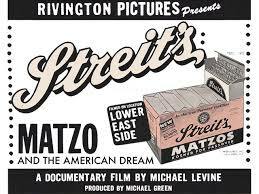 I followed filmmaker Michael Levine through Streit’s Matzo Factory, where the same family has been making flatbreads since 1925 on the Lower East Side (actually since 1916, but that’s another story to be revealed). One reason the story interested is because I like old stuff. Also, I have a huge fondness for the old Lower East Side, ever since I was chased down the old Orchard Street market by a Russian babushka who wouldn’t let me buy men’s shoes (don’t ask: 20 years later, it’s still a mystery to me). I was fascinated by the foreignness of the neighborhood and how time stood still on some blocks. I ate many a knish at Yonah Schimmels (still standing at 137 E. Houston St.) and rugulah at Gertel’s Bake Shop, an institution since 1914 on Hester St., now, sadly, closed. I need little encouragement to join the lamentations of what’s happened there. And so that’s why I was happy to discover the film, which celebrates not only the resilience of a fifth-generation immigrant business, but the ongoing small stories within the story. This is either why anyone becomes a journalist—whether it’s discovering the contents of Aron Yagoda’s desk or that the silent sullen guy on the package line is a 1964 Olympic boxer. Oh, back to Yagoda’s desk. One of three cousins who now run the factory, he sits at the same desk as his grandfather. He opened a drawer to show me a set of ancient false teeth (ID unknown), an old passport and some family ledgers dating to the 40s. He says he’s too superstitious to remove the stuff—especially the teeth. And so the vestiges of his ancestors, along with tradition, remain. You can read about why the Streit family preservers here [PDF]. But, just as extraordinary was the adjacent story of Mrs. Isabella Lee, who lives in the house formerly occupied by the matzo factory from 1916 until 1925. 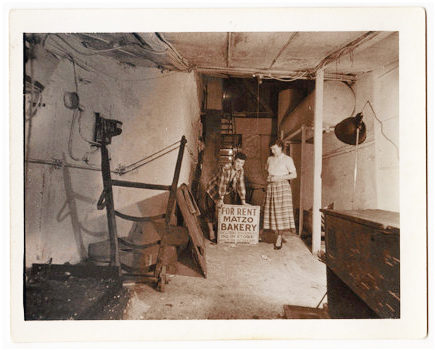 Mrs. Lee, her husband and another couple bought the abandoned matzo factory—complete with oven—in 1953, and renovated it to suit their particular living arrangements: Each couple had their own floor and they shared workshop and studio space. Mrs. Lee still occupies the apartment she and her husband, an educator, artist and cookbook author, fashioned out of found objects. Levine found her while researching the film, contacted her caretaker who lives on the premises and suddenly, one golden morning we all found ourselves there. Mrs. Lee, 91, has dark coppery hair, doesn’t see, and has a Ph.D in education. She spent a lifetime teaching and consulting in what was quaintly called “Industrial Arts.” She also worked as a proofreader and illustrated her husband’s cookbook, which is still widely considered one of the most authentic and approachable Chinese cookbooks written. She lives in a light-filled, art-filled apartment with handsome wood paneling—much of it salvaged from grand teardowns back in the day. She’s sharp as a tack, has an even sharper humor and a critical sense of politics, war and a rapidly deteriorating society. I’d nominate her for a Cabinet post. Mrs. Lee told us about finding the house—how she and her friends arrived from Detroit, holed up in a tenement at 3 Baruch Place ($27 a month for four apartments) and scoured the neighborhood—from Central Park South down to the Battery—by foot and bike, looking for a both a communal house and a community. That experience prepped her for the work ahead in her current digs. Mrs. Lee said she fought to keep the matzo oven so they could always remember what the house had once been. Her caretaker (actually the daughter of the other couple once living there: she lives in that apartment), Linda King, had taken us through the labyrinth of the house and its adjoining back house where Mr. Lee had a garret-like painting studio. The two buildings are separated by the three-story-high matzo oven, and wending through the basement level maze is a trip through time. Everywhere you looked, there was something to see. The unintentional electronics graveyard housed a few IBM Selectric typewriters, a photo enlarger, stereos throughout the years (I’m sure there was an 8-track player there somewhere). An old brass cash register in need of polish still showed it intricate ornamentation through decades of dust. We saw stacks of photos Mr. Lee printed himself, more stacks of his paintings, bicycles, encyclopedias (encyclopediae, if you want to be fancy). But aside from all the nostalgic chaos, it told the story of people’s lives, well-defined by layers of past learning, outmoded trends and long-abandoned hobbies. Above ground, too, you knew who Mrs. Lee was. An early painting of her hangs above the fireplace: a Matisse-inspired muse with short, dark hair. Not copper, but if you squinted, you could see the resemblance.